So took matters into my own hands and ordered the one off the G wagon and put it on - now looks right! They also are available on amazon...looks nice tho. Honestly, I hate all the badges on the cars now. "V8 biturbo 4matic space thruster thingamabob look at me"
That being said, yours is very subtle and tasteful and looks good. I just generally let my exhaust do the talking. I actually bought the knock off one first and it looks like **** (they actually represented it as real in a mercedes bag and all - AMG was crooked), got my money back and bought a real one. CLA is a step up though. Not a chance, drove one and then bought. w204 instead! Last edited by roadkillrob; 12-08-2016 at 08:54 PM. interesting. do you mind tell how to install the badge? is it sticked or bolted on? 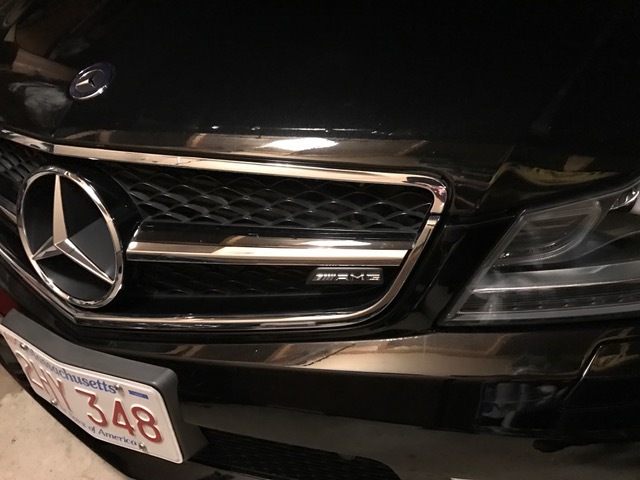 I would debadge a c300 too. LOL @ Magic I debagged my C63 the other day...not sure if I like it or not. It has 2 small holes to screw it on but would require taking out the grill to drill the holes, so I just used some 3M emblem tape to hold it (it is L shaped). Part number is 4638170200 and I ordered it from ECS. It terms of Mercedes class level it's supposed to be one step up. I am confused, are you saying the CLA is supposed to be one class up? Most high end cars in Europe don't come with rear badges at all. Also roadkillrob is right. CLA is down a class, not up. I thought that it was obvious that the CLA is above the C? I stand corrected. Starting prices on base CLAs is about $5k less than the comparable C class. I don't think has anything to do with base in the class type. I thought class levels per vehicle type went in alpha order? Maybe it changed? Same thing with BMW and their Series numbers. Yeah. I debadged my car. I only have the star on the front and back. It just looks cleaner to me. All my cars are like that. I figure that if you know it's a C63, then I don't need to tell you with a badge. If you don't know, then you probably don't care and a badge means nothing. Plus I hate the buildup of dirt and stuff you get around badges. It's much easier to keep things tidy with no badges.